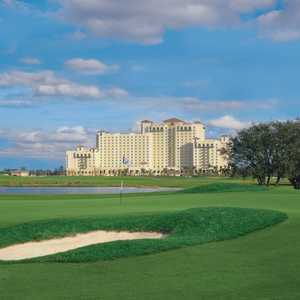 CELEBRATION, Fla. - Love it or hate it, a round of golf at Mystic Dunes Golf Club gives a deeper appreciation of the expression "drive for show, and putt for dough." No. 15 at Mystic Dunes Golf Club offers postcard-worthy views. Which is very likely what Gary Koch had in mind when he designed this par-71, 7,012-yard course. "It was a luxury to design," Koch said. "It was a unique opportunity, as the owners wanted something that people would talk about. I'd say we accomplished that." Located two miles south of Walt Disney World, Mystic Dunes gives you a blend of classic Carolinas and the great British Isles. Playing the front nine, you'll get a taste of the Carolina Lowcountry, complete with native wetlands and marsh areas, bordering oak and cypress forests. Following up with the back nine, you'll experience perimeter mounding, rolling fairways and quick putting surfaces. By the way, Mystic Dunes has a great year-round local rule in effect: "For all waste bunkers played, please lift, clean and place." One of the first things you'll notice about this golf course are the whiskey barrel, "give me a gun" bunkers. These steep, wooden-walled death traps make up nine out of the 36 bunkers on the course. Now if you play "smart" golf, these bunkers won't really be an issue for you, but should you get the wild hair and end up in one, that's when you should turn to your playing partner and say "give me a gun." That's because there's no way you're getting out of there. Pretty funny story: There was a solo playing behind us, and after the round, she joined us for a drink in the clubhouse, and she asked, "Are you actually supposed to hit out of those bunkers? I landed in one on the 15th hole, and after two tries, I hit it out backwards." Another distinguishing facet of Mystic Dunes Golf Club is its putting surfaces. These are by far the most undulating greens on any golf course I've played in the Orlando area. The best illustration of this is the green on the par-5 sixth hole. From top to bottom, the elevation on the putting surface drops eight feet. God help you if you aim center or left, you might as well pick up and take your max for the hole. They're not terribly tricky; like our starter said, "They're tough but true." All carts come equipped with GPS, and thank the golf gods for that. There are an unusually high amount of blind tee shots on this course, due in part to the as much as 80 feet of elevation changes on some of the holes. The most extreme example of this is the par-5 eighth, where the fairway rises dramatically from the tee box, blocking out the pin like a solar eclipse, then drops down to a green that is partially hidden on the approach shot. Beware of the left side of that hole; it's nothing but sand and sadness to all who fall prey. Be sure to bring a camera because the par-3 11th is definitely a hole you'll want to snap a picture of. It's the only hole where water is a factor, and it's absolutely beautiful. There's a waterfall on this hole, a rare thing to see on an Orlando Course. Mystic Dunes Golf Club was a real pleasure to play. It provides a good balance between challenging and fun. It requires you to play smart golf and really makes you work for your two putts. The course leading up to the greens was easier than I anticipated, but the opposite applies to the greens themselves. When the staff mentioned that the greens were tough, I took it with a grain of salt, because most courses feel they have some tough greens. But in this case, there was no exaggeration; the putting surfaces here will make you regret all those times you chose to hit the driver instead of the putter out at the range. Mystic Dunes has received its fair share of accolades over the years. In 2007, it made it into Golfweek's "Top 100 Resort Courses in the U.S." Golf Digest rated it in the "Best Places To Play" giving it 4.5 stars. 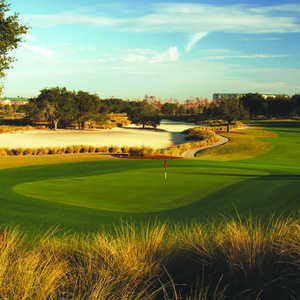 TravelGolf.com ranked Mystic Dunes No. 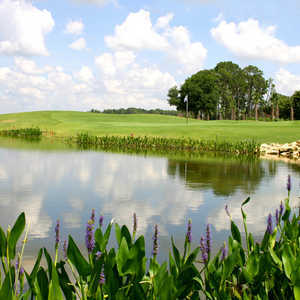 2 among "Orlando's Top 5 Golf Courses." Course amenities include a 20,000-square-foot, full-service pro shop, Kenzie's Steak House (serving breakfast, lunch and dinner), a 7.4-acre driving range, and putting and chipping greens. It's also home to the Advantage Golf School, named one of Golf Magazine's "Best Golf Schools in America." Dave Lair, writer of OrlandoGolfBlogger.com, is one of those rare Orlando natives. He has spent many years passionately pursuing that mistress we all call golf. In this pursuit, he has played many of Central Florida's finest golf courses and has gained valuable insight into what makes a course worth playing.